Website you need to use for notes on simple machines. 2. Period 1 Only - Sophomores need to complete the Work and Power Problems worksheet. It is due at the start of your next class. 3. Power Lab. You will complete both parts of this lab. We will start with Part B and then will do Part A. 4. HOMEWORK: NONE, unless you are a sophomore in my period 1 class. 1. Complete Quizizz game for the Do Now. The game code is 929441. 2. Work and Power . . . one more time! 2. Get the second page of the Work, Power, Simple Machines, and Energy notes. Make sure you say,"Thank you" to the substitute. 3. Use this website to complete the notes on Wheel and Axle, Inclined Plane, and Screw. Just summarize these simple machines. 4. Finish the notes using the Google slides posted to the right! 5. Once you've finished these notes, find the first page and STAPLE these two papers together. Please put the first page on TOP! 6. Use your notes to complete this Quizizz game. The Quizizz game code is 488425. Just a reminder, I set this game up to ring my phone when you submit the game. While I'm driving to my conference, I will be listening to make SURE you submit this Quizizz game. When you click on submit, my phone app, which will be connected by Blue Tooth to the car, will stop playing my music and will read off your name to me. NOTE: If you do NOT like your score, you may retake this Quizizz as many times as you need. I will just hear your name on my car's audio system more than once. I'm alright with that. 7. Turn in your stapled notes once you have FINISHED the Quizizz game. Make sure your name is on it! Place it in the tray on the teacher's desk! 8. Build a roller coaster using this site. You cannot stop building a roller coaster until your Safety Rating is a thumb's up AND your Fun Rating is a thumb's up! 9. You are done now. Enjoy your weekend! Stay OUT of trouble. See you Tuesday! 3. SP - Work & Power. You will find this on Rose-Prism.org. 4. CFA - Work & Power. In order for you to take this CFA, you have to score at least an 85% on the SP - Work & Power. 7. CFA - PE/KE Problems. In order for you to take this CFA, you have to score at least an 85% on the SP - PE/KE Problems. ​8. Homework: NONE, unless you didn't finish #6 and/or #7. Wednesday, October 24 - PSAT Day. This is only for 5th period. 1. Cancel Do Now - We need to switch rooms. 3. Energy of a Roller Coaster - online activity - complete and turn in. 2. Review for the Work, Power, and Energy Test which happens your next class. 3. HOMEWORK: Review for test. This test will be online. 3. CSA (Test): Work, Power, Energy Test. This is on Rose-Prism.org. 4. Turn in your review guide and any other missing work! 5. Energy of a Roller Coaster online activity. Website for this assignment. 6. Turn in the completed activity. 9.HOMEWORK: Bring your text book next class. 1. Do Now: Check your science grade. 2. Begin writing Roller Coaster Research Paper. Here is the example of what we completed in class today. 1. Wiggler Lab: due at the end of today's class. 2. Finish notes from last week. November 26 and November 27 - Wave test is this FRIDAY! 4. Part 3 Notes. Website needed for today's notes. November 28 and November 29 - Wave test is FRIDAY! 4. HOMEWORK: Complete wave review guide. You have a test on Friday! 2. Turn in COMPLETED review guide and anything else you want me to grade. 3. Lab: Exothermic or Endothermic. Turn in lab at the END of today's class. 3. Complete and turn in missing assignments. 1. Finish review guide. As promised at the end of last class, I will give you 30-minutes to complete the semester I review guide. 3. HOMEWORK: STUDY! STUDY! STUDY! STUDY! Make sure you look at the finals testing schedule below. 3. Turn in your review guide and everything you have stapled to it in my box. 4. 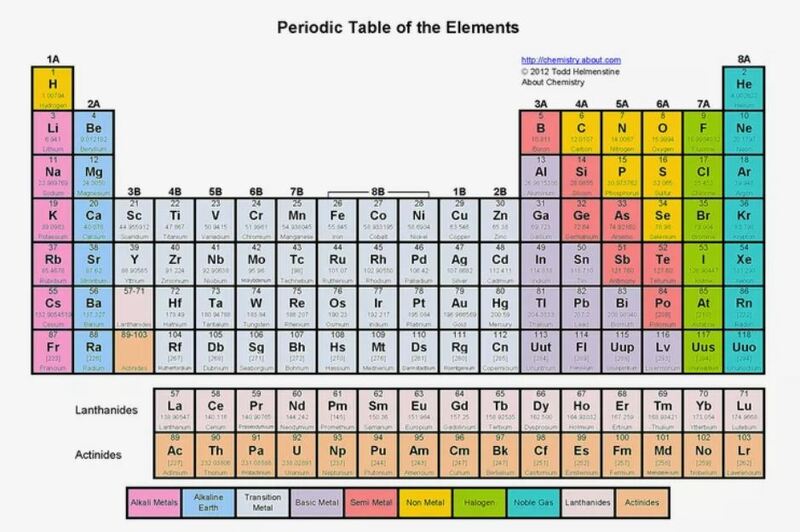 Pick up a Periodic Table of Elements and color like you see below. Yes, you may substitute colors -- just make sure you color the KEY! 5. HOMEWORK: NONE . . . well, you MUST stay out of trouble and you MUST study for your next final and you MUST have a great day! 1. Period 1 and 5. Review for your period 7 finals. 2. Period 8. Quiznetic Game. 3. HOMEWORK: ALL STUDENTS - Finish studying this evening for your Period 2 Final and Period 6 Final. Remember that finals count for 20% of your overall semester grade.